The paper "Hegemonic currencies during the crisis: The dollar versus the euro in a Cartalist perspective," discussed here before, has been published in the Review of International Political Economy (subscription required). A previous version here. 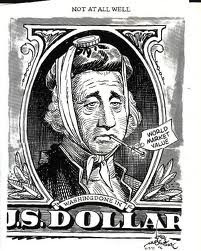 The paper suggests that the dollar is not threatened as the hegemonic international currency, and that most analysts are incapable of understanding the resilience of the dollar, not only because they ignore the theories of monetary hegemonic stability or what, more recently, has been termed the geography of money, but also as a result of an incomplete understanding of what a monetary hegemon does. The paper argues that the dominant view on the international position of the dollar has been based on a Metallist view of money. In the alternative Cartalist (or Chartalist) view of money, the hegemon is not required to maintain credible macroeconomic policies (i.e., fiscally contractionary policies to maintain the value of the currency), but to provide an asset free of the risk of default. Further, it is argued that the current crisis in Europe shows why the euro is not a real contender for hegemony in the near future. THanks for the link Kostas. In fact, Linda Goldberg sent data to us, and we used some of her work on trade invoicing in our paper. Do you think the Renminbi will become a reserve currency in the next 20/30 years? I wouldn't expect it unless you think that in 30 years we will be buying oil in yuans.